Catherine Hartigan (“Kate” as I’ve called her since we met at my first job in the early 80s) and Nanci Hersh (who grew up in the same neighborhood as I did) were friends in high school. They stayed in touch through college, ended up on opposite coasts for the next 30 years. Then Facebook comes along and they reconnect. The rest is what will be “art history” —at least in the local sense. These two former Edison, NJ residents – both born and raised there – graduated from John P. Stevens High School in 1977, and shared a love of art. Cathie went on to Douglass to study fine arts and developed a love for photography. Nanci went to Pratt Institute in Brooklyn, NY and then graduate school at the University of Hawaii at Manoa. Cathie married, lived in Metuchen for some time, and later moved to Wilton, CT with her husband, son, and two spaniels. She enjoyed a successful career in finance for many years and practiced photography simply as a hobby. After moving to Wilton, she rekindled her passion for art, and started working on her photography career full time. Earlier this year, her work was part of a group show, “Four Wilton Artists” in Norwalk, Connecticut. “The Menemsha Series” of photographs is currently on display at Evolved Home Design in Wilton, Connecticut. Nanci has been a professional and teaching artist for the past 25 years. She lived for many years in Hawaii, and later to Chester County, PA where she now lives with her husband and two sons. Her work has been exhibited in Japan, Australia, Estonia and throughout the United States including “The Demoiselles Revisited” at Francis M. Naumann Fine Art, New York, “As She Sees It: 8 Artists” at the Pierro Gallery of South Orange, New Jersey, and the 43rd Annual National Print Exhibition at the Hunterdon Museum in New Jersey with her print, Women’s Work, selected for the invitation. Her print Birdbath is included in The Best of Printmaking: An International Collection selected by Lynne Anne and Phyllis McGibbon and published by Rockport Publishers, Inc. 1997. Partnering with her cousin and author, Ellen McVicker, Nanci illustrated her personal story in their award-winning book, Butterfly Kisses and Wishes on Wings: When someone you love has cancer... a helpful, hopeful book for children. The book is now is its 5th printing and was recently released in Spanish. Even though their lives had taken different paths on different coasts, time didn’t change the bond of friendship. Cathie found Nanci’s book online and looked her up on Facebook. They reconnected, and discovered they were both now on the east coast and were both still creating art. During one of their conversations, Cathie mentioned she was off to Martha’s Vineyard for a family summer vacation. Nanci asked Cathie to keep her eye out for any fishing nets as she was incorporating net imagery in her new work. Cathie found a perfect old fishing net in a second hand store. Cathie sent the net to Nanci as a gift, along with one of her photographs with nets as the subject as well. Such is the story of “Catching Up” – two Jersey girls returning to their roots, and sharing their passion for color and light, capturing nature and beauty, weaving it into the lines and threads of their lives. The show will include a selection of their work: Nanci’s Koi Pond paintings and Catherine’s landscape photographs, including her work of select images from subjects on Martha’s Vineyard. Both have shared that they feel their work shares a strong relationship in style and subject matter. “While biking on Martha’s Vineyard, I became captivated by nets lying on the fishing docks in Menemsha. This series is a culmination of these powerful images filled with strong, vibrant color and contrasting textures,” Cathie noted in regard to her collection. “The Koi Pond Series grew out of an intention to feel centered or grounded in a time of transition. These paintings are about finding the grace and beauty in the ebbs and flow of life,” Nanci shared. The show starts on September 21st, running through November 16, 2013 at the Transformations Gallery at the Old Franklin Schoolhouse, 491 Middlesex Avenue (Rt 27) in Metuchen, NJ, across the street from Metuchen Boro Hall. The artists will be present at a reception will be held from 7:00 through 9:00 pm on September 21st. The art that is on display at the show will be available for purchase through November 16th. There will also be an artist talk and workshop that is open to the public on Sunday, September 22, from 12:00 noon through 2:00 pm at the gallery. 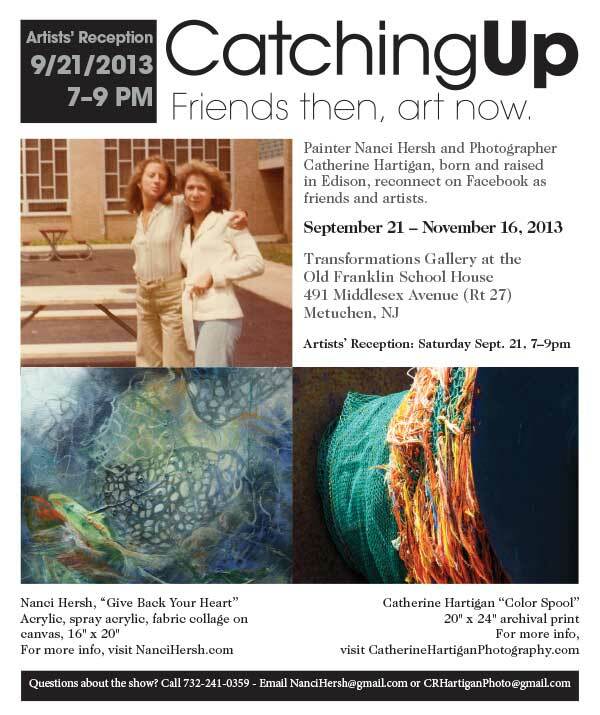 The artists will discuss their work in the Catching Up exhibition. The workshop is entitled “Learn to Transfer” in which they will teach participants how to transfer their favorite images from one surface to another. The artists noted that these are simple techniques that are great for collage, journaling, or mixed media work. All materials will be supplied, however participants are encouraged to bring their own magazines or ink jet prints to transfer. The workshop is free and open to public; no experience is necessary. I’m happy to have worked with them on this branding project, developing a theme and brand for the show, along with their print and online marketing pieces. Their work is beautiful – compelling images, striking colors, intriguing composition. If you’re in the metro NY/NJ area, please be sure to stop in. Metuchen has a local train station and the gallery is just a two block walk down a Main street filled with great restaurants and pubs.